(Nanowerk News) ESA today inaugurated a new hub that will strengthen Europe’s contribution to the global hunt for asteroids and other hazardous natural objects that may strike Earth. Near-Earth Objects, or NEOs, are asteroids or comets with sizes ranging from metres to tens of kilometres that orbit the Sun and whose orbits come close to that of Earth. There are over 600 000 asteroids known in our Solar System, and almost 10 000 of them are NEOs. Dramatic proof that some of these could strike Earth came on 15 February, when an unknown object thought to be 17–20 m in diameter exploded high above Chelyabinsk, Russia, with 20–30 times the energy of the Hiroshima atomic bomb. The resulting shock wave caused widespread damage and injuries, making it the largest known natural object to have entered the atmosphere since the 1908 Tunguska event. This is the second centre to be opened under SSA leadership after the Space Weather Coordination Centre that opened in Brussels last month. Located at ESRIN, ESA’s centre for Earth observation, the centre was formally inaugurated today by Thomas Reiter, ESA Director of Human Spaceflight and Operations, together with Augusto Cramarossa, Italian Delegate to the ESA Council, and Claudio Portelli, Italian Delegate to the SSA Programme, both of ASI, the Italian space agency. 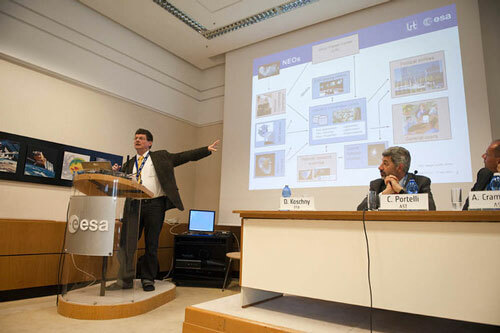 The event was hosted by Volker Liebig, ESA Director of Earth Observation Programmes and Head of the ESRIN Establishment. The new centre will support experts in the field by federating new and existing European assets, systems and sensors into a future NEO system. It will support the integration and initial operation of ESA’s NEO information distribution network. The Centre is also the focus point for scientific studies needed to improve NEO warning services and provide near-realtime data to European and international customers, including scientific bodies, international organisations and decision-makers. Of the 14 ESA Member States participating in SSA, nine are supporting NEO activities, including Belgium, the Czech Republic, Finland, Germany, Luxembourg, Poland, Romania and Switzerland in addition to Italy. “I am pleased to see strong support for the NEO segment of ESA’s SSA Programme by Italian industry and academia,” said Claudio Portelli, Italy’s representative to the programme from ASI. The NEO-CC itself is a dedicated control room where operators monitor and continuously update observations from professional and amateur teams across Europe. It provides an interface to the Minor Planet Center, the global clearing house for NEO observations operated by the International Astronomical Union at the Smithsonian Astrophysical Observatory in the US. The Centre is networked with the EARN Near-Earth Asteroids database developed by the DLR German Aerospace Center in Berlin and the NEODyS Near-Earth Objects Dynamic Site database operated by Space Dynamics Services S.r.l. at the University of Pisa. This last activity is supported by ESA and the Institute for Space Astrophysics and Planetology (IAPS), an institute of the Italian National Institute for Astrophysics (INAF). The Centre also incorporates the IAPS/INAF ‘Spaceguard Central Node Priority List’, a listing of discovered objects whose orbits merit further confirmation. The Centre was established and built by an industrial team led by Telespazio S.p.A. Ten European industrial partners and organisations from Italy, Spain and Germany are participating in the Centre’s development and operation.